Introduction: Single incision laparoscopic cholecystectomy (SILC) may offer advantages over traditional laparoscopic cholecystectomy. However, surgeons must be able to offer this procedure with equal safety and results. 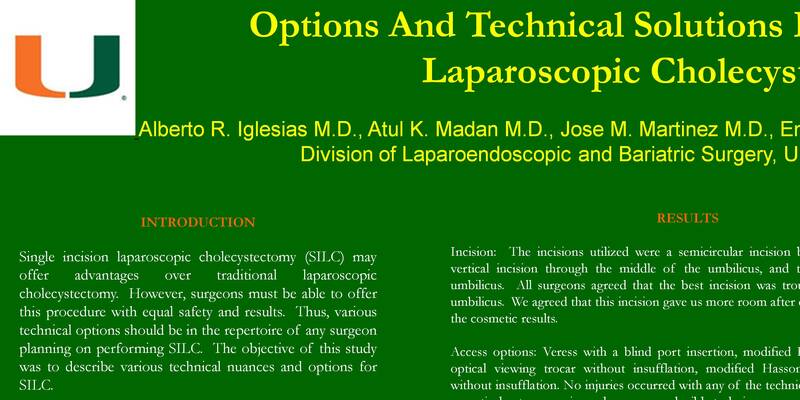 Thus, various technical options should be in the repertoire of any surgeon planning on performing SILC. The objective of this study was to describe various technical nuances and options for SILC. Methods: Technical variations and options were reviewed from patients who underwent SILC. Advantages and disadvantages were ascertained from the operating surgeon on all cases. Any other involved laparoscopic surgeons were asked to give input about the various options. Results: For incision the options note were: vertical through the umbilicus, transverse through the umbilicus and below the umbilicus. For access to peritoneal cavity: Veress needle, optical viewing trocar without insufflation, modified Hasson, and blind insertion. For trocars: low profile 5mm trocars, two 5 mm trocars of varying length, and a larger trocar with separate openings. For optics, options were: angled 5 mm rigid laparoscope, angled 45 cm 5 mm scope and a flexible tip 5 mm laparoscope. For retraction: third instrument and transabdominal sutures. For securing of traction sutures: figure of 8 and clips. For dissecting instruments: standard 5 mm laparoscopic Maryland dissector, standard 5 mm laparoscopic right angle dissector, reticulating and articulating 5 mm laparoscopic Maryland dissector, and 5 mm ultrasonic dissector. For removing the gallbladder: laparoscopic 10mm retrieval bag versus no bag. The preferred options were a vertical incision through the umbilicus, an optical view trocar, larger trocar with separate openings, flexible tip 5 mm laparoscope, transabdominal sutures, figure of 8, ultrasonic dissector and laparoscopic retrieval bag. Conclusions: While various technical options are available, a preferred and reproducible technique has been developed. Surgeons should understand the various alternatives to their preferred technique in SILC. These various options should enable easier adoption of SILC for most surgeons.